Recently Oakley Philippines launches the newest X Metal Collection, following a highly successful US debut. Oakley X Metal Collection's polarized Madman and Badman carry the industrial design language and durability that distinguishes Oakley sunglasses. Innovative design coupled with cutting-edge materials like lightweight die-cast aluminium with O Matter, a durable stress-resistant frame material, highlight the Madman and Badman models. Madman and Badman sunglasses are integrated with High Definition Optics, that allow Oakley eyewear to meet or exceed the testing standards of the American National Standards Institute for optical clarity, visual fidelity, and impact resistance. Both sunglasses feature Plutonite® Lens, one of the best materials for optical purity and clarity in eyewear today. They filter out 100% of all UVA, UVB, UVC and harmful blue light, with UV protection derived from the lens material itself, and not just from a coating. Oakley HDPolarized® lenses further contribute to sun protection by filtering 99% of reflected glare without the haze and optical distortion that can come with polarized lenses made with conventional manufacturing techniques. Aside from its great sun protection, Oakley performance eyewear is renowned for protection against high-velocity and high-mass impact. This can be attributed to the unique architecture and advanced premium materials used for Oakley lens and frame combinations. 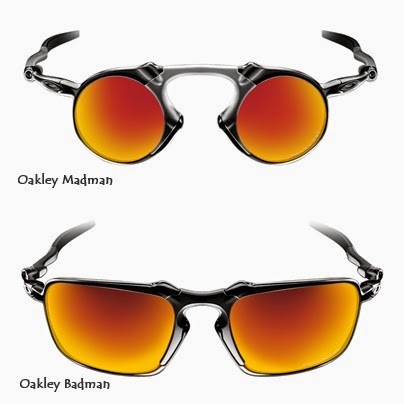 Madman designed with a roundish lenses, while Badman with a slightly different silhouette. But both have a full metal protection against high-velocity and high-mass impact.